The default iOS lockscreen is little more than a glorified wristwatch; functional, but not very useful for much else than checking the date. Having a jailbroken iOS device opens up a Pandora's box of possibilities, allowing you to add more info and a personal touch to the most basic of your phone's functions: the lockscreen. There are a lot of one-click themes already available on Cydia (the jailbreaker's App Store), but they're not always perfect. Today we'll be loading up a sleek, easily customizable lockscreen that gives you the date, the time, and the weather in a stylish format. When you've finished, you'll have a lockscreen like in the image above (which you can also customize if you wish). Download the theme appropriate for your current version of iOS. Unzip the download and locate LockBackground.html. Open this with your plain-text editor of choice (Notepad/TextEdit will do), find "var locale: Los Angeles, California," and input your own location. This will give you the weather for your area. Save and close. Open up iPhoneExplorer and navigate to Root/Library/Themes. Copy the entire unzipped theme folder into your "Themes" folder. Open up your Settings on your iPhone and go to Clock Hide. Enable Clock Hide. As the name suggests, this will hide the default clock on the lockscreen as well as the status bar time and the date on your lockscreen. Go to CleanStatus. CleanStatus is a way for you to control exactly what is shown on your status bar, and has a variety of choices. Enable CleanStatus. Turn "on" Carrier Name and anything else you want to hide in your status bar. Go to Winterboard. Winterboard, once known as Summerboard in the 2G days, is a little app that lets you choose your various themes for your iOS device. Go to Select Themes. Select the theme we just set up. Go back to Winterboard. Tap on "Respring." By respringing, you will basically soft restart your springboard, which is where all of your apps are stored for your perusal. Ta-da! 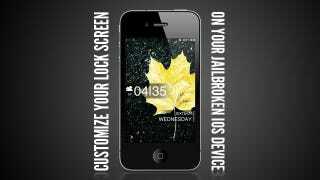 You will now have a customized lockscreen on your iPhone! It should look something like the image to the left. If you'd like to change the wallpaper for the lockscreen background, just overwrite the background.jpg with your wallpaper of choice in the theme folder. If you're a veteran iOS customizer, let's hear what apps and hacks you turn to when you want to bend iOS to your whim in the comments.